Images and specs of a new Sony full frame compact camera have leaked over the weekend. 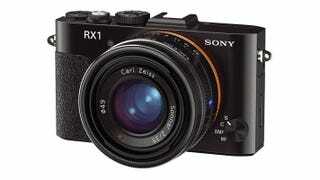 The alleged new camera, called RX1, appears to squeeze DSLR-like specs right into your pocket—for a purported $2,800. PhotoPrice reports that the camera looks to pack a Carl Zeiss 35mm f/2.0 lens and a 24-megapixel full frame sensor into its tiny frame. Elsewhere, it also claims it will feature 14-bit RAW, an ISO range of 100-25,600, 5fps continuous shooting, HD video recording, a magnesium body, a 3-inch LCD screen, and the option of optical and electronic external viewfinders.